In spite of many other misnomers about behaviours in Nigeria, is this one that I want to opine. I was in a conversation with 4 men, and one of them said something that kept me chilled. He mentioned that "It's not everything that I tell my wife ooo " and with further probe on the why, he said he tried telling her certain things before and she didn't handle it well" and thought, he could tell us -mere acquaintances, but not tell the only woman with whom he has a covenant with! ...and I have heard men and women voice this unacceptable behaviour, by reasonable standards! So your wife shouldn't know but family and friends will know abi? It kept me wondering "What do we think marriage is?" Marriage should be about two purposeful people, one a leader, the other the (engine room), the help, with the idea to live, love and propagate God's agenda on earth and raise Godly seed too. But what we see, is men thinking there are things you shouldn't tell your wife. For them, you have to keep some mystery around you as a man to retain respect and whatever else they presume! 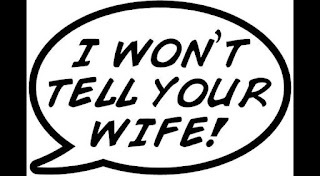 Again, even if you don't tell your wife certain things, by nature, she feels it and so where is your mystery, man? It's like going to see a doctor for an ailment and refusing to explain how you feel so he can give you right diagnosis, and treatment but you stay dying because of stupidity. What is so hard you can't tell your wife? If it goes wrong, won't she be the chief sufferer? With your own children looking on? What does human dignity and mutual respect mean to us? Single guys, if she wants you to lie and pretend to have or know what you don't, don't dump her with an apology. There's so much greatness and honesty in you to waste on an undeserving person. What does marriage mean to us sef ? Is it just 'some ceremony' adults do? If it is, then God is being doubted. PS: Not all men do this. Some women too believe men shouldn't say everything and so those women too keep secrets. I am not unaware that there are dysfunctional people in each of the divide. The amazing thing from most of the responses I got was that most men married "immature' wives who cannot handle the truth. That kept on being emphasised, how telling their wives will make things worse so it's better to not disclose everything that happen on a daily basis, especially as it concerns money, relationships and daily challenges. Just one man, said he tells his wife EVERYTHING afterall they took a vow to share their lives...and that man made me have a bit of balance. I have also always known that most Nigerian men like to marry women who they are not at par with them intellectually, emotionally, financially et al so as to feel in charge and that dysfunctional mindset have led them to actually own up through the responses on this post. I was not surprised, because as a Men advocate, I do relate. I believe Nigeria can only develop, when we have men who are interested in developing themselves and even develop the women around them as well as marry to achieve life purpose. The issue of purpose is the key and so many people are far from knowing which is why they also make wrong life choices. For now, let me take a breather while I expect to hear from you.